附属装置 1. The mixing drum and the helical blades adopt high-intensity wear-resistant material, improving the service life by over 59%. 2. The unique space helical blades improve the mixing efficiency by 35%, reducing the mixing time. 3. Small volume truck mixer is optimal in small volume concrete and mortar construction. 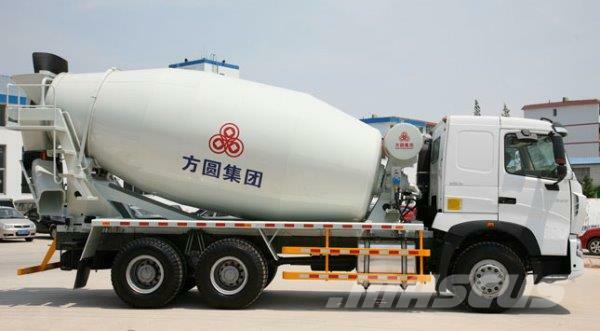 Its using with large volume truck mixer can save the operating costs by 80%~200%. 4. Adopt the box structure design and made by the 8mm-thickness rectangle high-intensity steel pipe. Compared with the same industry (5-6mm thickness), the service life improves by 50%, and the concrete transportation cost of each ton reduces by 1.6%. 5. The humanized 3-point linkage operation allows various operations of mixing drum in the cab. 其他信息 6. The convenient and high-efficient water supply by air pressure cleans clearly and thoroughly. Adopt the parts of famous brand. The service life of the steel water pipe is five times of common water pipe. 7. Higher safety performance and optimal axle load distribution improve the service life of the truck by over 30%. 8. Three kinds of salvage disposing schemes prevent the residual mud polluting the roads, which is environmental friendly and practical. 9. The automatic temperature control radiating oil tank with vacuum meter effectively ensures the stability and reliability of the hydraulic system.